I don’t do a whole lot of baking, even at Christmastime. In fact, my entire holiday baking plan includes two recipes – sugar cookies and ginger snaps. They are both good, non-dairy for Sophie, and easy to make. A few weeks ago I started daydreaming about a Christmas treat I remember from when I was a kid – Chocolate Covered Peanut Butter Balls. It turns out that there are tons of variations on this treat, but the one I really wanted was the kind served up in Central Minnesota c. 1985. Luckily for me, my mom’s friend Betty had the exact recipe I was looking for. In fact, there’s a good chance that I had one of these cookies made by Betty back in 1985. This no-baking required cookie is super easy to make. Simply mix together a few ingredients, roll them up, dip them in chocolate, and set them somewhere cool to set. Here in December, that place is the Minnesota Walk-in, also known as the garage. If location makes this impossible, you could use the refrigerator. I’m so glad that Betty had the recipe and was willing to share. She’s an excellent baker. 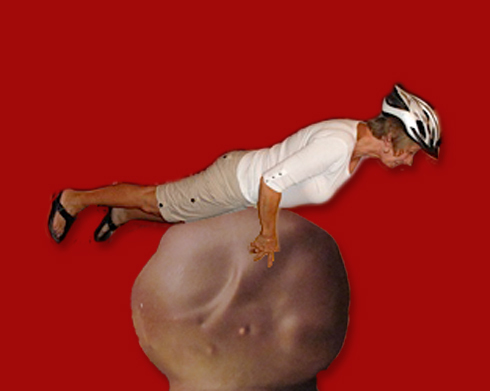 Oh look, here’s Betty now, planking on a giant peanut butter ball. Safety is important to Betty, so she wears a helmet whenever trying new stunts. These treats are delicious and super easy to make. There were some differences though when I made the non-dairy version, so I would not recommend a 1:1 substitution of ingredients if you use dairy. To make it easier, I’ve included printable versions of Betty’s original recipe and the non-dairy version below. Make some immediately, they will make you very popular this holiday season. In a double-boiler, melt chocolate chips. Reduce to low and keep warm until ready. In a large bowl, cream together sugar, peanut butter, and butter. Add water as needed to help the mixture stick together enough to form a ball that can keep its shape. Add rice krispies and mix until well combined. Form a ball with the peanut butter mixture about the size of a super ball. Set aside. Dip each in chocolate until totally covered, set on prepared cookie sheet. When all of the peanut butter balls have been dipped, place somewhere cool until the chocolate sets. – Usually I don’t find a ton of differences in recipes when I start to substitute ingredients. In making these, I made a few changes from the original. The non-dairy version was WAY dustier than I’d expected once I mixed together the first three ingredients. I added more peanut butter than used in the original, and also added some water to moisten the mixture enough so that it could form a ball. It could have been the non-dairy margarine, or the reduced-fat peanut butter. I’m not sure. Either way, if you find that your dough is too dusty, add water a teaspoon at a time until you can form a ball with the dough. – I used reduced-fat peanut butter because that’s what I had on hand, but I think it may have been the dusty dough culprit. You may want to use the regular chunky peanut butter, because this is not a health food anyway. – Speaking of health food, I didn’t even bother to calculate the calories on this one. I think there are a lot of variables that would change how many each recipe makes and the amount of chocolate needed to coat each one. My suggestion is to have a few and then immediately give the rest away. 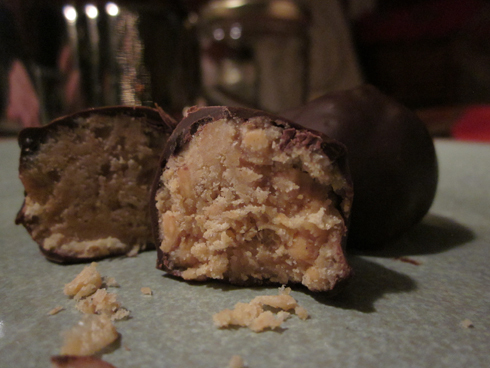 – I think I ended up with a couple dozen peanut butter balls when making the non-dairy version. They should be gone by morning.